In stock -This product will ship today if ordered within the next 6 hours and 9 minutes. 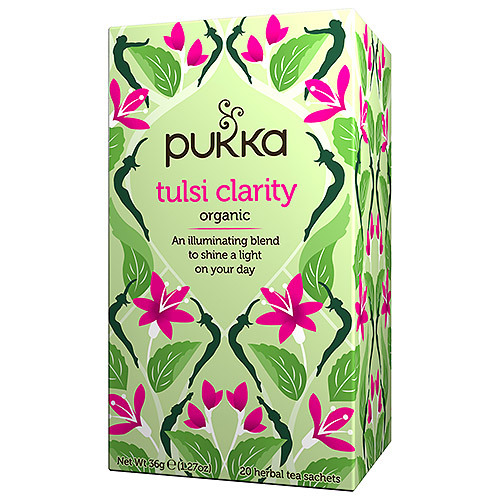 Pukka Tulsi Clarity Herbal Tea is a zesty blend of organic green tulsi, purple tulsi and lemon tulsi. Delicious, indulgent tea, brimming with flavour. Tulsi leaf blend (green Rama, purple Krishna, lemon Vana). Infuse for up to 15 minutes. Below are reviews of Pukka Teas Organic Tulsi Clarity - 20 Teabags x 4 Pack by bodykind customers. If you have tried this product we'd love to hear what you think so please leave a review. I’m a new customer. I like the tea. The delivery was good. All in all an excellent shopping experience. Love this tea, I tend to drink it in the evening and it has a wonderful calming effect. Gorgeous tea. Very refreshing taste. Excellent tonic and clearing for my lungs also. This is such a lovely tea, with a calming, relaxing effect. It is easy to drink and has a pleasant taste. I tend to drink in the evening. My favorite tea ever. I don't like to be without it and always have a cup in the afternoon. This is my first Tulsi tea. I love the taste of it and that there are three kinds of Tulsi in it, I believe it makes me feel calm and relaxed, not tired though. I am glad I bought so much of it. Lovely taste and is calming. I drink this at work to help manage stress. I think Tusli is a gentle but effective adaptogen herb. It works for me. I've also shared it with some of my colleagues and they enjoy it also.